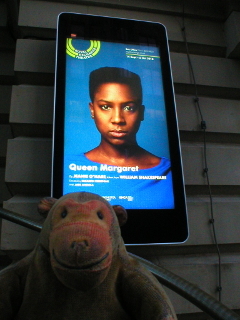 Mr Monkey looking at the electronic poster for Queen Margaret. Mr Monkey took the 192 into Manchester, and scurried along to the Royal Exchange Theatre to see Queen Margaret, Jeanie O'Hare's new play based on the work of William Shakespeare. Margaret of Anjou, the French wife of Henry VI of England, appears in four of Shakepeare's history plays, Henry VI parts 1, 2 and 3 and Richard III, and has more to say than any other woman character in Shakespeare (and more than Lear, too, though he gets a play named after him). O'Hare had the interesting idea of combining elements of the four plays to form a single piece depicting the conflict of the 15th century from Margaret of Anjou's viewpoint. The bulk of the script is by Shakespeare, though some characters have been merged or given someone else's lines, and a very helpful servant, Hume, is added. Queen Margaret presents the Wars of the Roses from the viewpoint of the losing Lancastrian side, with no attempt to correct Shakespeare's historical inaccuracies. It starts with Margaret's arrival in England to marry Henry VI, then covers the collapse of Henry's rule in the face of Jack Cade's rebellion and the Duke of York's scheming and Margaret's attempts to restore his position (Gloucester doesn't call her the She-wolf of France for nothing). After a lot of chaos and violence the Lancastrians are absolutely defeated at Tewkesbury, Henry VI dies of suspected regicide in the Tower of London, and Margaret returns to France after a period of imprisonment. The set is deceptively simple - a raised green circle, with five concentric circles divided into fourteen segments. The lines marking these divisions light up at different times, forming changing boundaries or the board of a game. As the play and the wars progress the stage, initially pure and clean, becomes littered with political pamphlets, broken games consoles, spent cartidge cases and other debris. Above the stage there are three neon rings, which light up at times. Mr Monkey suspects they represent the crown of England lying uneasily on the king's head. Queen Margaret is played in modern costume, suits for peacetime and combat fatigues for the battlefield. The clothing is well chosen for the characters - you can tell who is going to be single minded and determined, and who is going to change sides, just by looking at them. All the accessories are modern; Somerset fiddles around with an upmarket attache case, York's children play on consoles while discussing overthrowing the king. Mr Monkey was amused by the use of laminated cards on lanyards as indications of rank amongst the nobility, and was particularly impressed by one of Jack Cade's looters scampering across the stage with a widescreen TV clutched in his arms. Mr Monkey found Queen Margaret gripping from start to finish; the only weakness - which he didn't really notice at the time - is that there's no sense of that Margaret married Henry VI in 1445 and Henry died in 1471. He suspects he'd have a better sense of time if he'd seen all four of the source plays on the same day. Queen Margaret has a strong cast. 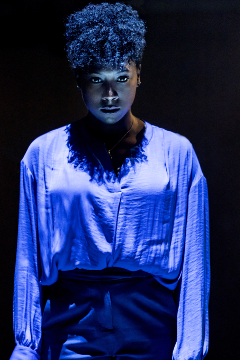 Jade Anouka is wonderful as Margaret, whether she's trying to win over a hostile court on her arrival in England, wreaking vengance on her enemies, or facing utter ruin. 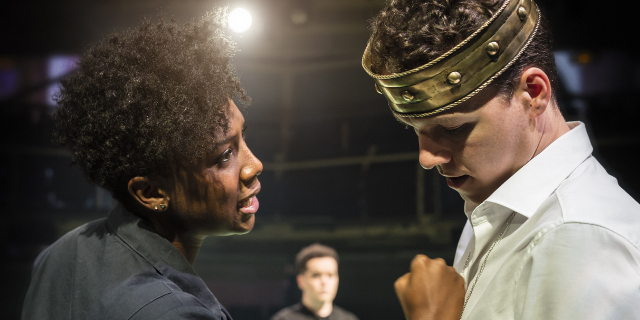 Lucy Mangan is an excellent manic pixie-like Joan of Arc haunting and inspiring Margaret, and Max Runham's Henry VI is convincingly pious and reliably useless in times of crisis (unfortunately, most of the play is a time of crisis). Lorraine Bruce is wonderfully as York, implacable and brutal until her final scene when she breaks under Margaret's taunts. Mr Monkey really liked Helena Lymbery as Hume, who obligingly introduces each scene, and shows the commoner's view of the destructive antics of the nobility. He was also very impressed with Kwami Odoom's switch from twitchy nervousness as Somerset to barely controllable aggression as Richard III. The rest of the cast are excellent as well. Mr Monkey really enjoyed Queen Margaret and recommends it to anyone who wants an evening of Shakespearian medieval mayhem. Queen Margaret runs until 6th October 2018.